The 4,200-foot long boardwalk begins off East Trail and takes walkers through thick forest of ferns, skunk cabbage, and moss before emerging into daylight. About a quarter of a mile from the beginning of East Trail, the 4,200-foot long Orono Bog Boardwalk enables visitors to City Forest to see a bog up close and personal without getting their feet wet. The boardwalk, a joint venture by the city of Bangor, the University of Maine, and the Orono Land Trust, has seen tens of thousands of visitors since opening in June 2003. The boardwalk’s season runs from May 1 until Thanksgiving weekend or the first snowfall, whichever comes first. From May through August, the hours are 7 a.m. to 6:30 p.m. For September, the hours are 7:30 a.m. to 5:30 p.m. From Oct. 1 through Nov. 1, the hours are 8 a.m. to 4:30 p.m. For November 2 through Nov. 30 or until the first snowfall, the hours are 8 a.m. to 3:30 p.m. The boardwalk is closed from Dec. 1 through April 30. Admission is free. The boardwalk is accessible to wheelchairs, as is East Trail. Bicyclists can park their bikes at the bike rack. Dogs are not allowed on the boardwalk. For more boardwalk rules, check the Etiquette link to the left. The bog itself encompasses 616 acres on the Bangor and Orono town lines and is home to hundreds of species of hardy yet fragile plants and some of Maine’s rarest bird species. 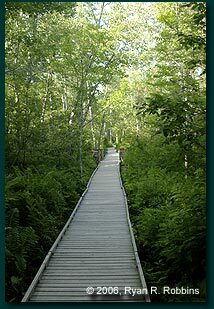 In the summer, the boardwalk offers educational tours that cover such topics as birds that call City Forest and the bog home, the geology of bogs, the Orono Bog’s hydrology, and plant life. In the fall, a UMaine astronomy professor takes visitors onto the boardwalk after nightfall to stargaze. Most of the guided tours are in the morning on weekends. All tours are free; however, advance registration is required. See the Orono Bog Boardwalk’s Web site for details. Groups can arrange special guided tours, too. 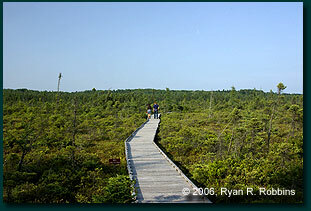 Visitors can walk along the surface of the sensitive bog while keeping their feet dry and preserving the bog's natural balance. The bog came to be about 10,000 years ago, after the glaciers that covered much of Maine’s surface melted and the Atlantic Ocean crept inland. When the ocean itself receded, lakes and ponds were left behind. Where the bog is today was once a lake. Over the last few thousands of years, the lake bed has dried enough to enable sphagnum moss to thrive over the exposed land. However, the high acidic content of the water that lies just beneath the surface of the land – a hallmark of all bogs – has stunted the growth of trees and flowers. This is why only pine trees are able to survive in a vast majority of the bog, and why the trees that have managed to take root aren’t much taller than 6-8 feet. Despite the poor quality of the bog’s soil, some plants have managed to flourish in the environment. The sundew and the pitcher plant give off scents that attract insects that then drown inside the plants’ flowers and are slowly digested. Seven kiosks along the boardwalk provide information on plants, animals, and the geology of the bog for visitors. The high acidic content of the bog’s water table is also responsible for the accumulation of peat, which in some places is more than two dozen feet deep. Peat consists of plants that have not been able to fully decompose in the oxygen-starved ground. It also lacks sufficient nutrients to allow new plant life to thrive as well as the plant life would in normal soil, another reason for the stunted growth of trees in the area. Because plant matter in the bog will never fully decompose, peat has been accumulating in the former lake bed for hundreds of years, making the land a raised bog. Another feature of bogs is they get their water from the rain mostly, and not from runoff or streams, although you will find channels of water throughout the northern end of the Orono Bog. As a child, you probably heard that the bogeyman might enter your bedroom one night and take you away. Where does the bogeyman come from, though? The bog, of course, hence the name bogeyman. In many places of a bog, the peat is so thick and the water so acidic that nothing can grow but sphagmun moss. 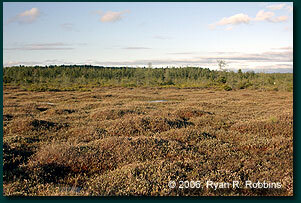 Thus, a bog is well-suited for preserving organic matter that has died, such as the bog people discovered in Western Europe. Thousands of years ago in Western Europe, some tribes held a great fear of bogs because bogs epitomized death and slow decay. To ward off whatever evil spirits might live in the vast stretches of wasteland in the wilderness, the tribes sacrificed their peers to bogs, often killing them in particularly violent ways and then burying the bodies in the peat. Some bodies showed signs of strangulation and others signs of being hacked. In some cases, only a head was found. Farmers who sold peat as fuel unearthed the bodies, which archaeologists dubbed the “bog people.” Most of the bodies that were found by farmers and then by archaeologists were so well-preserved that their skin and internal organs were still intact. In some cases scientists were able to determine the stomach contents of the victims. A vast majority of bog people wore virtually no clothes. Some had crude restraints tying their bodies to the ground, as though their killers feared they would rise from their shallow graves and seek revenge. Early literature depicted people’s fear of bogs and wetlands near the deep woods. In the classic poem “Beowulf,” Grendel emerges from the bog at night to eat men. The word “heathen” used to refer to non-Christian “barbarians” who lived in heaths and moors – forms of bogs. In Shakespeare’s “Hamlet,” spirits from the heath wandered around at night. Only when the erlking grabs the boy does the father believe his son. The father races home with his son in his arms, but when he opens his arms he finds his son dead. 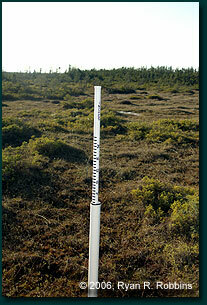 This measuring stick near the middle of the boardwalk's length shows how many inches of water are under the bog's surface. In 2000, UMaine biology professor Ron Davis proposed building a boardwalk that would begin in City Forest and stretch across the Bangor-Orono town line into the Orono Bog. For years Davis had been taking his students on field trips to the bog, some of which is owned by the university. But while Davis and his students could prepare themselves for excursions into the wetland by donning boots, waders, and other clothing, the bog wasn’t as accessible to the public. In fact, most residents in the Greater Bangor area probably weren’t even aware of the bog’s existence because it is tucked away between Stillwater Avenue, Forest Avenue, and City Forest. The best way to bring people to the bog and protect the wetland’s fragile surface, Davis realized, was to build a floating boardwalk. 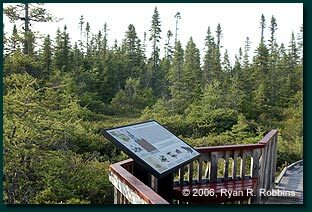 Construction began in 2002, with volunteers cutting a narrow path through the dense forest off East Trail to the edge of the bog. They then set up a staging area and built 8-foot sections of boardwalk made from hemlock. As workers finished each section, they rolled it into place after previously finished sections. When they reached the Orono town line, workers divided into two groups to create the loop. The two groups met near the middle of the boardwalk. To help keep the structure level with the rising and falling water levels of the bog beneath it, designers placed plastic floats to rise and fall with the water level and bog floor. The boardwalk was completed in spring 2003 and opened on June 23 the same year. In summer 2004, workers built an outhouse and a small cabin for storing tools, educational materials, and for docents to escape the mosquitoes.